Use the “Find Help By Topic” index (over to the top right) to find the posts that will help you the most. Some are about finding topics (Do you know the secret of using a “mundane” topic, yet?). Others have great writing advice for once you start your rough draft (The Ladder of Abstraction can help you structure your personal narrative!). 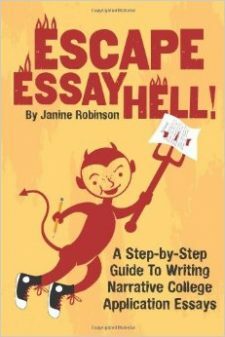 A few are about polishing your essay. And there are many more in between. If you have the time, I would actually recommend starting at the very end of this blog and scroll and skim through them, the older posts. Some of my best stuff is way down there. Don’t want to pressure you, but the clock is ticking!! I just found your blog! Your articles are very helpful for students applying to college. Keep up the good work.